Posted March 1, 2016 under Ask Us. The goal of managing lactose intolerance is to lessen or stop symptoms of diarrhea, stomach cramps, bloating, and gas, while still getting the nutrients that your body needs. Eating or drinking less food that contains lactose, such as milk or milk-containing products will help lessen or may even stop your symptoms all together. Since dairy products are a main source of calcium and Vitamin D in our diets, getting enough nondairy sources of these nutrients is extra important. 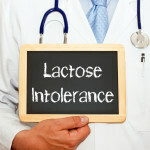 It is also important to remember that there are different degrees of lactose intolerance. Some people with a moderate intolerance can handle 1 cup of milk without symptoms, whereas others can only tolerate a small amount. Regular intake of small amounts of milk is helpful in getting enough important nutrients and may increase the threshold at which symptoms occur. Over time you will be able to learn how much milk or dairy products you can comfortably eat/drink. Talk to your health care provider and find out if you can meet with a Registered Dietitian to help manage your symptoms.